It’s been reported already that noted writer Sai Madhav Burra is writing the dialogues for Megastar Chiranjeevi’s ambitious 151st film, Sye Raa Narasimhareddy. The film is a historic biopic on the first Telugu freedom fighter, Uyyalawada Narasimhareddy. Going by Sai Madhav’s repertoire that includes thought-provoking dialogues in Khaidi No.150, Gautamiputra Satakarni, MMIRR and Kanche, it was expected that the writer will come up with something hard-hitting for Sye Raa. Meanwhile, a dialogue from the film’s script where Uyyalawada Narasimhareddy confronts a British officer has been doing the rounds in the media and it is goosebumps inducing to say the least. The dialogue goes like “Orey..nenu otti chethulatho vachcha..Nuvvu bhujam mida thupakitho vachchav..Aina naa cheyyi meesam midaki vellesariki ni battalu thaduchipothunnay raa..” Needless to say that there’s plenty more to come from this prolific writer. 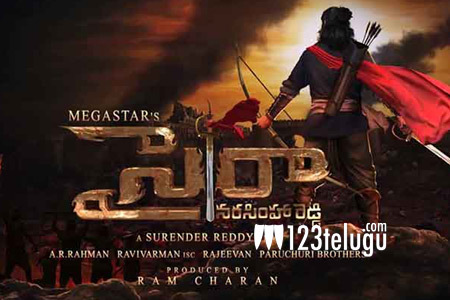 Sye Raa’s regular shoot will kick-start in the first week of December. Surender Reddy is helming this prestigious project and Ram Charan is producing it. Amitabh Bachchan, Nayanthara, Sudeep, Vijay Sethupathi and Jagapati Babu will essay crucial roles in this magnum opus. AR Rahman is the film’s music composer.